On Tuesday morning last week MPs, MEPs, and representatives of various organisations with a stake in post-Brexit UK science gathered in the Churchill Committee room at the House of Commons for the launch of the “Scientific priorities for Brexit” report, published by Stephen Metcalfe MP, chair of the Commons select committee on science and technology. Venki Ramakrishnan, President of the Royal Society, addresses the meeting in the Churchill Room. The report, released under the auspices of the Parliamentary and Scientific Committee, is the result of widespread consultation with universities, learned societies, campaign groups and industrialists. It pulls into sharp focus the principal challenges raised by Brexit and sets out priorities for the British negotiators who will have to hammer out an exit deal with the EU over the next 18 months, and for the government’s domestic R&D policy. The recommendations are split into four key areas. First and foremost are the rights of EU nationals working in the UK R&D sector – at all levels. It was heartening to see people identified as the central concern. However, the recent failure of Parliament to pass an amendment to the Article 50 bill which would have guaranteed their residency rights nationwide hung over the room like a grey cloud. It was in my opinion a callow piece of political miscalculation, a view that I do not hold alone. At the meeting Labour MEP Clare Moody relayed the views of UK nationals living in the EU whom she’d spoken to. All were clear in their belief that it would in fact be their interests for the UK government to behave honourably with regards to EU nationals living in Britain. The remaining three areas are investment in research and innovation, collaboration and networks, and regulation and trade. In brief, the report emphasises the importance of finding some way to maintain access to EU funding mechanisms, the immense value of the multilateral collaborative networks that the EU is so good at fostering, and the need to ensure that the UK remains at the leading edge of developing regulatory frameworks to facilitate trans-national science and trade. I won’t go into further details because the summary statement is succinct (and supported by a longer evidence report) – and because I have covered some of this ground before. But I want to reiterate the point that the government’s current and welcome commitment to underwrite UK participation in the EU’s Horizon 2020 research programme will not be sufficient to protect UK-based researchers looking to forge long-term collaborations in the EU. This is because their European colleagues cannot have confidence in the ability of their British partners to continue to collaborate on funding applications made post-Brexit. The Chancellor’s announcement in the Autumn statement of significant new money for UK research and innovation over the next four years is certainly encouraging – as indeed is the CBI’s new-found enthusiasm for a total UK R&D spending target of 3% of GDP (re-iterated at the meeting) – but the government needs to go faster and further. In particular, it needs to articulate clear plans for shoring up Britain’s international research prospects beyond 2020. Those prospects seem to take a hit every time one of the more thoughtless Brexiteers opens his mouth. Boris Johnson has been upbraided for his wayward rhetoric on Britain ‘liberating’ itself from the EU. And this past week Bill Cash MP surprised the European Scrutiny Select Committee by suggesting that UK negotiators should remind the EU of the cancellation of German debt after World War 2. Such arrogant pronouncements, coupled with the fact that Brexit has been dubbed ‘Empire 2.0’ in the corridors of Whitehall, serve only to confirm the impression that Brexit is driven by an ignorant and backward-looking vision of Britain and its history. They are squandering the good will forged over many years thanks research collaborations and many other joint activities between Britain and the EU. But it’s not just the image of Brexit, put about by the likes of Johnson and Cash, that is the problem. 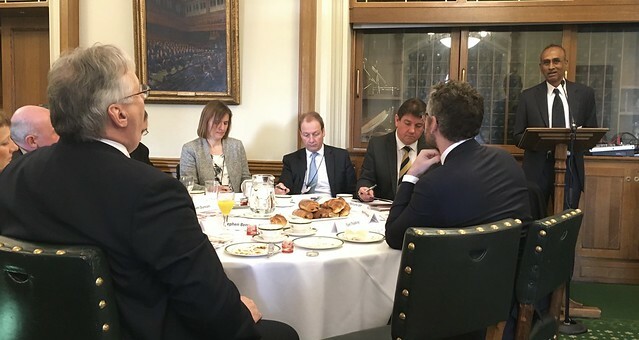 While it was encouraging last Tuesday to see politicians come together from across the political spectrum to fight for science in the forthcoming negotiations, the mood in the plush surroundings of the Churchill Committee room was one of grim resolve. The difficulties we face are deep-rooted because of the way that Brexit rips through the international fabric of science, plunging us in a direction that takes us away from our colleagues, from our collaborations, and from greater purpose. I thought by this stage I would be less angry. But I’m not, and this fight goes on. This entry was posted in Brexit, Science & Politics. Bookmark the permalink.